The city’s fascinating historical heritage, rare blend of East and West, authentic glimpses from the past, and unique mix of religious beliefs and remnants from different cultures, have all turned akko into one of the most vital Ancient World cities. Akko’s walls, fortresses, castles, churches, mosques, synagogues and other structures tell the story of the many rulers that governed, fought for, built and adorned the City. Akko’s sites include remnants of the Hellenistic-Roman period as well as structures from the Crusader and Ottoman periods: the underground Crusader city, Khan al-Umdan, the Turkish Baths, the Bahai Temple, the Ramchal Synagogue, etc. In Akko you will find the traces of a great many nations and religious movements ranging from the Canaanites, the Romans, the Byzantines, the Crusaders, the Mamluks and the Turks to the Brtish. 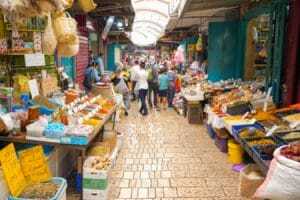 Akko’s colorful Oriental markets, city walls, museums, beaches and water sports facilities, Fishermen’s Port, marina, restaurants, hotels and annual picturesque festivals are just a few more of the City’s tourist attraction. Visiting Akko is an emotional journey to a glorious past and a one-of-a-kind experience. Join us for an exciting visit to an ancient city with a young soul – a city declared by UNESCO as a World Heritage Site.